Lung cancer is one of the leading cause of death worldwide. According to the American Cancer Society, NSCLC has a greater prevalence in men than women, and is the more common cancer type over SCLC.1 NSCLC is highly metastatic and unresponsive to the conventional chemotherapeutics due to inappropriate accumulation of drug in the tumor, high toxic profiles to the normal cells and multi-drug resistance (MDR).2 Recently, nanoparticle-based theranostics have been employed for the targeted treatment of solid tumors to increase the efficacy of conventional anti-cancer agents and to alleviate their toxic effects as well. There are many nanotechnology-based drug delivery systems are available, including, polymeric,3,4 metallic (iron oxide, cerium oxide, silica, platinum and gold)5-12 and viral nanoparticles.13,14 The advent of personalized nanomedicine has opened up new opportunities for the timely diagnosis and targeted treatment of cancer.15,16 Beyond cancer drug delivery, nanoparticles can also be used in other applications, including magnetic resonance imaging,8 pathogen detections,9 optical imaging,8 and DNA and gene delivery.6 The applications of the nanotechnology-based drug delivery systems in cancer therapies has been very successful due to their size in nanometer scale, allowing for the effective clearance by the kidney and lungs, enhanced retention time in blood circulation and therefore, effective delivery of drugs to the tumor. As a whole, nanoscale delivery system offers a great homing for anti-cancer agents and protects the drug from releasing outside the target site. Therefore, it controls accumulation of drugs at the tumor site, pharmacokinetic and dynamic parameters, and toxic effects towards the treatment.17,18 The standard course of treatment for patients with advanced NSCLC often includes combination therapy using more than one therapeutic drugs. The main advantage of combination therapy is the synergistic action of two or more drugs, targeting broad spectrum of tumorigenesis mechanisms, and results in fewer side effects.19-21 However, repeated failure of these therapies due to MDR, poor bioavailability and severe side effects indicated that there is a need for suitable drug combinations and delivery system. In the present study, we aimed to use two different drugs with specific mechanism of action in order to enhance therapeutic action. One of them is ganetespib (GT), a heat shock protein 90 (Hsp90) inhibitor, and the other is a new platinum-based drug, platinum cyanoximate complex Pt(MCO)2 (Pt), an antineoplastic therapeutic agent. The proposed drug mechanisms of action is highlighted in Figure 1. The latter compound belongs to a series of new cytotoxic platinum and palladium-based compounds with cyanoximes-based ligands that have demonstrated significant in vitro cytotoxicity against human cancer cells.10,22,23 The abbreviation for MCO stands for 'cyanoxime anion: 2-oximino-2-cyano-N-morpholyl-acetamide, C7H8N3O3-'. In this work, we have used Pt as a potential new anti-cancer drug and its therapeutic efficacy was evaluated using MNPs as drug delivery system. The anti-tumor activity of Pt was compared with that of cisplatin (cis-diaminodichloroplatinum, CDDP). In addition, Hsp90 inhibitor, GT, was used along with Pt to evaluate the synergistic effect on NSCLC treatment. 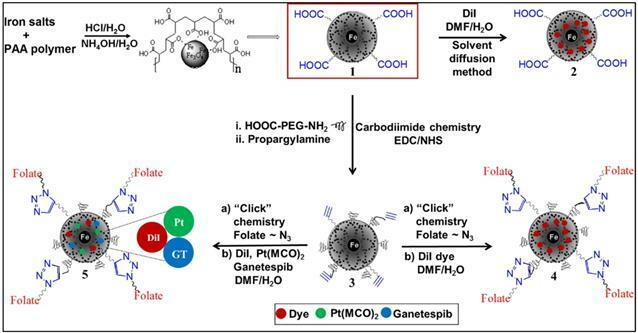 Herein, we have formulated a novel, folate decorated, DiI dye, GT and Pt co-encapsulating MNPs for the imaging and effective treatment of NSCLC. The effective loading of these cargos and the NSCLC targeting was monitored by MR and optical imaging, respectively. The PEGylation of MNPs further enhanced its aqueous stability and bioavailability. The use of Pt drug, which would help to improve the targeted therapeutic efficacy of GT. Taken together, this work would develop new magnetic nanotheranostics for the multiparametric imaging and effective combination therapy of NSCLC in the clinical settings. Polyacrylic acid (PAA)-coated, superparamagnetic iron oxide nanoparticles were synthesized using water-based precipitation method as described in our previously reported method29 and detailed in the experimental section. Briefly, a mixture of an acidic solution of iron salts (FeCl3.6H2O and FeCl2.4H2O) was precipitated in NH4OH and followed by addition of PAA solution. The iron concentration was calculated using “iron digestion method”29,30 and was found to [Fe] = 4.2 x 10-3 mol. The size of the synthesized MNPs were obtained using dynamic light scattering (DLS) measurement and the average diameter was found to be 68±2 nm, as shown in Figure 2A. The overall size of MNPs was measured in triplicates. The size of the magnetic core was determined using transmission electron microscope (TEM) and found to be 8 ± 3 nm (Scale bar: 100 nm. Inset: Figure 2A). These results confirmed the presence of thicker (~30 nm) PAA coating in our synthesized MNPs (1), indicated the possibility of cargo encapsulation in higher concentrations. The presence of PAA polymer coatings on MNPs were confirmed by the appearance of carbonyl stretching band at 1656 cm-1 using FT-IR spectroscopy (black line, Figure 2B). Successful coating of PAA polymer was further confirmed by observing negative zeta potential value ζ= -31 mV (SI, Figure S1). Surface carboxylic acid groups of PAA-coated MNPs (1, [Fe] = 4.2 x 10-3 mol) were PEGylated using polyethylene glycol (NH2-PEG-COOH, Mw = 600 Da, 10.0 mmol) polymer and water-based EDC/NHS (10.0 mmol) carbodiimide chemistry.29 PEGylation has been done to increase the stability and for longer circulation in blood of MNPs.31-33 After magnetic purification, the dialyzed PEGylated MNPs are then propargylated using propargylamine and the EDC/NHS-based carbodiimide chemistry, as described earlier. The resulting PEGylated and propargylated MNPs (3, Scheme 1, [Fe] = 3.8 x 10-3 mol) were then purified and functionalized with folic acid using the “Click” chemistry.29,34-36 Folic acid is a folate receptor targeting ligand, and therefore, this conjugation would facilitate targeting folate-receptor expressing NSCLC using our folate-decorated MNPs. Azide-functionalized folic acid (10.0 mmol) is synthesized as described in the supporting information (Scheme S1) and the “Click” chemistry was performed with MNPs 3 (4 mL, 3.8 x 10-3 mol) in the presence of CuI catalyst (2.0 µM). The resulting folate functionalized MNPs (4a and 5a, Scheme 1) were purified using magnetic column and dialysis membrane before detailed characterizations, and the iron concentration was calculated [IO] = 3.1 x 10-3 mol. The presence of folate groups on the surface of MNPs were confirmed by UV-Vis and fluorescence spectrophotometric analyses. 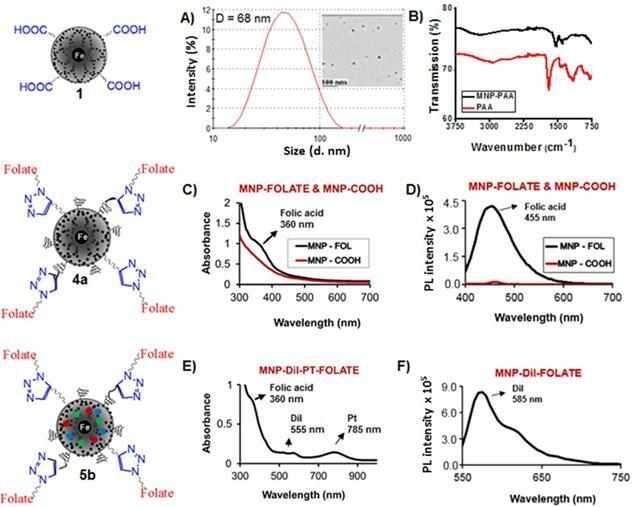 The characteristic UV absorption maxima at 360 nm (Figure 2C) confirmed the presence of folate groups on the surface of MNPs and the fluorescence band at 455 nm further indicated successful conjugation of folic acids (Figure 2D). Modified solvent diffusion method26,29 was used to encapsulate dialkylcarbocyanine lipophilic fluorescent dye (DiI) and therapeutic drugs Pt and GT within the hydrophobic PAA polymer coating of MNPs. The new platinum drug, Pt, was previously synthesized22,23 and a brief synthetic protocol and characterization are outlined in the supporting information (Scheme S2, and Figure S2 and S3). The successful encapsulation of cargos inside the nanoparticle depends on several important parameters including hydrophobicity, diameter and thickness of the PAA coating. The lipophilic DiI dye that fluoresce at 585 nm and drugs were incorporated with high encapsulation efficiency (EEDiI = 88%, EEGT = 82%, EEPt = 74%) as described in the experimental section. These resulting functional MNPs (5b, Scheme 1, [Fe] = 2.5 x 10-3 mol) were purified using magnetic column and eluted using PBS, pH = 7.4 and detailed stability studies were performed by collecting DLS and T2 MR data with time (SI, Table S1-S2 and Figure 5b). The effective encapsulations of cargos were confirmed by spectrophotometric and magnetic relaxation (MR) techniques. Presence of Dil dye was confirmed by UV-Vis (λabs = 555 nm) and fluorescence band (λmax = 585 nm, Figure 2E and 2F). The presence of therapeutic agent Pt was confirmed by collecting absorbance band at 785 nm (Figure 2E). However, the presence of non-fluorescent therapeutic agent GT was tracked by MR study by using bench top magnetic relaxometer.37,38 Encapsulation of GT in the PAA coatings of MNPs leads to change in spin-lattice and spin-spin magnetic relaxation times (ΔT1 and ΔT2 ms) due to replacement of neighboring water molecules from the vicinity of iron oxide core. This increase in magnetic relaxation times confirms the loading of GT inside the nanoparticles and the results are displayed in Figure 3A-3B. Drug release studies were performed using dynamic dialysis method29,38 at two different pH, acidic pH 6.0 and physiological pH 7.2. It is hypothesized that at pH 6.0, the PAA polymer coatings of MNPs will be disrupted or swelled and consequently, the encapsulating cargos will be released, which demonstrate the fate of MNPs inside the tumor. The release of Pt drug was monitored time to time using a plate reader and measuring UV/Vis data at 785 nm. As shown in Figure 3C, 60% of Pt drug was released within 6 h, when dialyzed at pH 6.0. In contrast, minimum release of Pt drug (4%) was observed at pH 7.2. 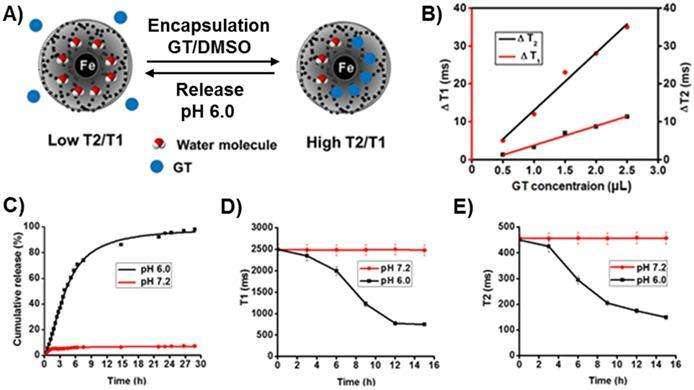 These results indicated that our functional MNPs are stable at physiological pH, whereas, it would deliver the encapsulating cargos within the acidic microenvironment of cancer cells. In addition, the release of GT was monitored using MR technique as release of cargo would reduce the T1 and T2 MR signals, this also includes DiI dye and Pt drug release. However, we have demonstrated GT release study using MR technique as it does not fluoresce. MNPs aliquots were collected directly from inside the dialysis bag and both T1 and T2 MR were collected at different time points. As encapsulating GT released, water molecules replaced, and therefore, significant change in both T2 and T1 MR signals were observed (Figure 3D and 3E). These MR studies showed 50% change in the T1 and T2 signals within 6 to 7 h of incubation, which indicated for the equivalent amount GT release. These release studies further indicated for the drug delivery capability of our MNPs in cancer cells, whereas minimal release is expected in healthy cells (pH = 7.2). In addition, as the internalization mechanism is receptor-mediated, we expect no to minimal drug delivery in healthy cells. In conclusion, these experiments suggested that our functional MNPs are stable at physiological pH and deliver cargos when inside the tumor's acidic environment. To examine the uptake of MNPs into NSCLC by endocytosis, folate-decorated DiI dye encapsulating MNPs (4b, 75 µL, [Fe] = 3.1 x 10-3 mol) were incubated in the presence of metabolic inhibitors: sodium azide (10 mM) and 2-deoxyglucose (25 mM) at 37 oC as well as incubated at 4 oC for 24 h. Fluorescence microscopy was used to evaluate the internalization results using A549 cells (10,000 cell/well). Minimal fluorescence was measured from the cells incubated in the presence of inhibitors and at 4 oC. 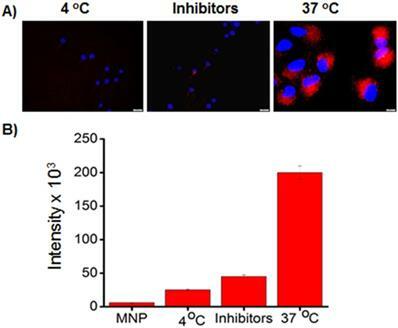 (Figure 5A) The decrease in MNPs uptake under these conditions indicated that the folate MNP's internalization depends on the energy (ATP-related) and temperature status of A549 cells. This is due to the fact that the metabolic inhibitors, sodium azide and 2-deoxyglucose, create an ATP-depleted environment inside the cell.41 These results indicated for the active internalization of MNPs via endocytosis,42,43 which was further confirmed by observing higher fluorescence from the cells incubated at 37 oC. The extent of internalization was cross-validated by measuring fluorescence emission intensities from the MNPs internalized cells. The collected results corroborated the hypothesis of internalization mechanism and displayed in Figure 5B. A) Determination of cellular internalization of folate-MNPs (4, Scheme 1). Minimal internalizations at low temperature and in the presence of metabolic inhibitors at 37 oC indicated for the endocytosis mechanism (scale bar 20 µm). B) Quantification of cellular uptake of folate-MNPs via fluorescence intensity measurement using a plate reader. The fluorescence intensities from the MNPs incubated A549 cells were measured at 585 nm. These results indicated for the endocytic internalization mechanism. To further indicate the selective uptake of our folate conjugated functional MNPs in A549 cancer cells, we have used fluorescence microscopic technique for internalization experiments. We hypothesized that folate MNPs with drugs would be toxic to cancer cells (A549, FR +) but minimal to normal cells (CHO, FR -) due to lack of internalizations. Next, A549 cells (10,000 cell/well) were treated with carboxylated MNPs (75 µL, [Fe] = 2.5 x 10-3 mol) with combination of drugs (GT and Pt) for 24 h. As expected, due to the absence of folate group on the surface of MNPs, minimal internalizations with no effective cell death was observed (Figure 6A-6D). However, folate receptor-mediated internalization was confirmed by observing effective internalizations of MNPs-DiI-FOL (5a, 75 µL, [Fe] = 2.5 x 10-3 mol) with no drug in A549 cells (Figure 6E-6H). Next, we investigated for the therapeutic efficacy of our folate MNPs with combination of drugs. Interestingly, folate receptor-mediated endocytosis and mitotic cell arrest, leading to A549 cell death was observed when incubated with folate-decorated GT and Pt drugs encapsulating MNPs (5b, 75 µL, [Fe] = 2.5 x 10-3 mol) for 24 hours (Figure 6I-6L). These results corroborated our cytotoxicity assays and further indicated that the poor therapeutic efficacy of GT towards NSCLC treatment can be accelerated by using the proposed combination therapy approach using new platinum drug Pt. In contrast, no significant cellular internalizations and reduction in cell viability were observed when CHO cells (10,000 cell/well), which do not overexpress folate receptor, were incubated with folate MNPs (5b, 75 µL, [Fe] = 2.5 x 10-3 mol) with combination of drugs for 24 h (Figure 6M-6P). These results demonstrated that our folate MNPs carry the following important features: 1) non-toxic and biocompatible when no drug carried, 2) targeted drug delivery to cancer cells, minimizing toxicity to healthy cells and side effects, 3) can be used for optical and MR imaging of cancer, and 4) capable of delivering more than one drug for the combination therapy of cancer. Morphological and biochemical changes including flipping of phosphatidylserine (PS) and loss of membrane potential occur as a result of apoptosis, a programmed cell death, and in events through necrosis.47,48 In this study, these changes were examined by using Annexin V-FITC (green color for apoptotic cells) and Ethidium homodimer III (red color for necrotic cells) dyes. Cells were platted in tissue culture dishes (10,000 cell/well) and treated with functional MNPs (5b, 75 µL, [Fe] = 2.5 x 10-3 mol) encapsulated with Pt, GT and combination of these two drugs for 12 h. Results indicated that cells treated with GT (Figure 8A-B) and Pt only MNPs (Figure 8C-D) showed increased number of apoptotic cells (A, green color) with very few necrotic (N, red color) and live cells (L, dim green). As expected, A549 cells incubated with combination drugs, Pt and GT, have also showed higher number of apoptotic cells (Figure 8E-F). These experiments indicated that our newly formulated drugs encapsulating nanomedicines prefer apoptotic programmed cell death pathway. K-RAS driven NSCLC is known to be undruggable and highly metastatic. Advanced staging and high metastatic ability of NSCLC are the results of cell invasion from primary tumor site to other tissues or organs.49 In this study, we have investigated the effect of combination therapy using GT and Pt drugs encapsulating MNPs in the migration of A549 cells using transwell migration assay kit from Millipore. The starved A549 cells were incubated with functional MNPs with and without drugs and allowed 24 h for migration. The migratory or invaded cells were quantified using CYQuant cell lysis buffer and using a plate reader (λem = 560 nm). The results showed that highest fluorescence was observed from cells incubated with control MNPs with no drugs as highest number of cells migrated through the collagen layer. In contrary, very minimal fluorescence was observed from A549 cells incubated with experimental MNPs with drugs (Figure 9). This is due to the action of therapeutic agents on inhibition of migration process, and very few cells migrated to collagen layer. These results demonstrated that our combination therapy would prevent NSCLC metastasis effectively. The comet assay is widely used as standard in vitro technique for predicting the response of chemotherapeutic drugs in different cancer cells.50,51 In the current study, alkaline comet assay experiments were performed for the assessment of possible DNA damage induced by the Pt (Figure 10B) or with a combination of Pt and GT (Figure 10C) encapsulating MNPs (5b, 60 µL, [Fe] = 2.5 x 10-3 mol). Following the treatment of A549 cells on a 12-well plate (8,000 cells/well), different comet assay parameters including olive moment, tail moment and % of DNA in the tail were analyzed to quantify the extent of DNA damage. Olive moment indicates and measures smallest and broken pieces of DNA, while % tail DNA reflects DNA damage in the tail part and tail moment is the all broken DNA in the tail (Figure 10D). These three parameters are often used for scoring of comets and to determine the effect of drug treatment. Control experiments were also performed using MNPs with no drug (5a, 60 µL, [Fe] = 2.5 x 10-3 mol, Figure 10A) and exhibited minimal DNA damage. 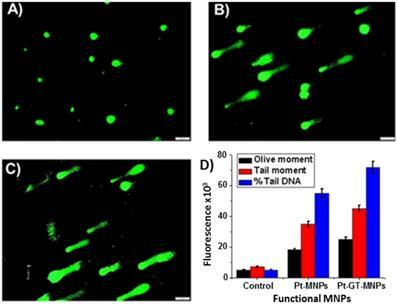 As shown, A549 cells treated with Pt showed significant amount of DNA damage as reflected by higher values of olive and tail moment along with elevated percentage of tail DNA (Figure 10B). The extent of DNA damage was further enhanced with the combination drug treatment (Figure 10C). Ferric chloride hexahydrate (FeCl3.6H2O), ferrous chloride tetrahydrate (FeCl2.4H2O), hydrochloric acid and ammonium hydroxide were obtained from Fischer Scientific. DMF, DMSO, 3-(4, 5-dimethylthiazol-2-yl)-2,5-diphenyltetrazolium bromide (MTT), N-hydroxysuccinimide (NHS), polyacrylic acid (PAA), propargylamine (PA) and other chemicals were purchased from Sigma-Aldrich. Optical dye (DiI-D282), dihydroethidium (DHE), mitosox red and 4,6-diamidino-2-phenylindole (DAPI-D1306) were purchased from Invitrogen, whereas the (1-ethyl-3-[3-(dimethylamino) propyl] carbodiimide hydrochloride) (EDC) was obtained from Pierce Biotechnology. MES sodium salt was purchased from Acros organic. Apoptosis and necrosis quantification kit was purchased from Biotium and the migration assay kit was purchased from Millipore. The human lung carcinoma cell line A549 (CCL-185) and Chinese hamster cells (CHO) were obtained from ATCC. Magnetic column QuadroMACSTM LS was obtained from Miltinyi Biotec and the dialysis membrane was purchased from spectrum laboratories. Dulbecco's modified eagle (DMEM) medium and Kaighn's modification of Ham's F12K medium from Corning. The overall size and zeta potential of nanoparticles were measured using Dynamic light scattering (DLS) instrument, Zetasizer Nano ZS90, from Malvern. Infrared spectra were recorded on a PerkinElmer Spectrum TWO FT-IR spectrometer to confirm the presence of PAA coating. UV/Vis and fluorescence spectra were recorded using Tecan plate reader (Infinite M200PRO). Magnetic relaxation (MR) times (T1 and T2 ms) were measured by using Bruker's benchtop magnetic relaxometer mq20, 0.47T (B = 20 MHz). Fluorescence microscopic images were taken using Olympus IX73 microscope. MTT cell viability study was completed using the TECAN Infinite M200 PRO multi-detection microplate reader. PAA coated magnetic nanoparticles were synthesized by “water-based precipitation method” (Scheme 1). Three solutions were prepared to synthesize PAA coated MNPs. Iron salt solution (0.75 g of FeCl3.6H2O and 0.41 g of FeCl2.4H2O in dilute HCl solution 2M in DI H2O), an alkaline solution (2 mL of 30% NH4OH solution in N2-purged 30 mL deionized water) and stabilizing agent solution (900 mg of PAA in 5 mL DI water). The synthetic procedure includes: The addition of the iron salt solution into an alkaline solution with simultaneous vortexing. Then, a stabilizing agent was added and the reaction was continued for 60 min. Thereafter, the resulting MNPs were centrifuged at 4000 rpm for 30 min. The supernatant obtained after the final centrifugation was purified by using QuadroMACSTM magnetic LS column. The concentration of iron in the magnetic nanoparticles was determined using our previously reported “iron digestion method”. The presence of negative zeta potential and characteristic acid carbonyl bands on the FTIR spectra confirmed the successful coating of PAA on the magnetic nanoparticles (Figure 2A-2B). To synthesize PEGylated MNPs, 5 mL of MNP (1, [Fe] = 4.2 x 10-3 mol) suspension was mixed with EDC (10 mM) and mixed for 10 seconds, followed by addition of NHS (10 mM) in MES buffer (pH 6.0) and incubated for 3 minute at room temperature on table mixer. Finally, polyethylene glycol, NH2-PEG-COOH (8 mM) in 500 µL of H2O was added to the reaction mixture drop wise and incubated at room temperature on a table mixer for 4 hours. The resulting PEGylated MNP suspension was purified using dialysis membrane (MWCO 6-8 KDa) and suspended in PBS solution. For the synthesis of propargylated PAA-MNPs, 4 mL of PEGylated MNP suspension (1.0 mM) was mixed with EDC (1-ethyl-3-(3- dimethylaminopropyl) carbodiimide hydrochloride) (10 mM), and NHS (2-(N-morpholino) ethanesulfonic acid) (10 mM) in MES buffer (pH 6.0) followed by 3 minutes incubation. Finally, propargyl amine (10 mM) in 500 µL of DMSO was added to the reaction mixture drop wise and kept for incubation at room temperature on table mixer for minimum of 4 hours. The resulting propargylated MNP's (3, [Fe] = 3.8 x 10-3 mol) suspension was purified by passing through magnetic column to remove unreacted reagents from the suspension. Folate conjugated MNPs were synthesized by adding 4 mL suspension of propargylated MNPs (3, [Fe] = 3.8 x 10-3 mol) in PBS (pH 7.4), a catalytic amount of CuI 2 µL (2 µM) and 500 µL of azide functionalized folic acid (Fol~N3, 3 x 10-2 mol, See SI Scheme S1 for detailed synthesis) with continuous mixing. The final suspension was incubated at room temperature on table mixer for minimum of 5 hours. Finally, the resulting MNPs (4a, 5a, Scheme 1) were purified by magnetic column to separate unreacted chemicals from the reaction mixture. The purified folate conjugated MNPs ([Fe] = 3.1 x 10-3 mol) were characterized by using UV-Visible spectrophotometric measurements. 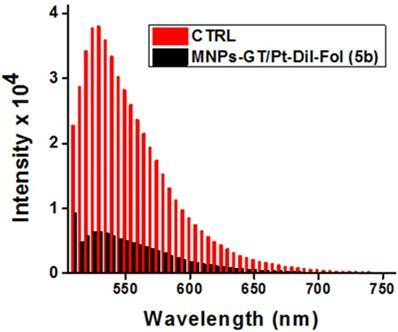 Presence of absorption and fluorescence bands at 360 nm and 455 nm, respectively, indicated for the successful conjugation of folate ligands on MNPs (Figure 2C & 2D). Dye encapsulation was completed using “modified solvent diffusion method”. In this method, we have taken a 2 mL suspension of corresponding MNPs (1 and 3a, 1.0 mM) in PBS (1X, pH = 7.2), and a solution of DiI dye (1.0 µL, 5 µg/µL) in 100 µL of DMF was added in a drop-wise manner with continuous stirring at 1000 rpm at room temperature. The resulting dye-encapsulating MNPs (2, 4b) were incubated for 3 h on a table mixer and purified by passing through magnetic column. UV-Visible spectrophotometric measurements were used to confirm the presence of DiI inside the MNPs. Successful encapsulation of DiI was confirmed by presence of absorption and emission peaks at 555 nm and 585 nm, respectively (Figure 2E & 2F). The HMCO cyanoxime was prepared according to the reported procedures,22,24,52,53 and characterized by NMR spectroscopy. Platinum complex was obtained from K2PtCl4 and deprotonated MCO- anion (as Na+ salt) using simple two step procedure as shown in SI Scheme S2 and Figure S2. Briefly, Na2CO3 was added to a stoichiometric amount of HMCO in 10 mL of water with intense stirring. A bright-yellow turbid solution of Na(MCO) was filtered off and resulted in transparent solution of the ligand. Then, Na(MCO) (0.195 g, 0.954 mmol) in 5 mL of water was added dropwise within one hour to an aqueous solution of K2PtCl4 (0.198 g; 0.477 mmol) in 5 mL of water. The reaction mixture became red, but then slowly within ~1 hr gained a green color, and turned to a dark, blue-green, very fine suspension after about five hours. The reaction monitoring is depicted in SI Figure S2. The precipitate was filtered off, washed with 5 mL of water and dried in a vacuum desiccator charged with c.H2SO4. The yield of dry dark-green Pt(MCO)2 was 0.152 g (76%). For C14H16N6O6Pt calculated (found), %: C - 30.06 (29.71), H - 2.88 (2.93), N - 15.02 (14.82). The solid complex is thermally stable to ~160 oC, not hygroscopic and has a shelf life time over 4 years. To a 2 mL suspension of MNP-folate in PBS (5a, [Fe] = 3.1 x 10-3 mol), a solution of Pt (10 µL, 5 µg/µL), GT (10 µL, 5 µg/µL) and DiI dye (1.0 µL, 5 µg/µL) in 100 µL DMF was added drop-wise at 1,000 rpm with continuous stirring. The resulting suspension was incubated at room temperature on table mixer for 60 min. Final suspension was purified by using magnetic column to remove unreacted chemicals and drugs and the final concentration of 5b was adjusted to [Fe] = 2.5 x 10-3 mol. Presence of DiI and Pt complex in the MNPs (5b) were confirmed by using UV-Vis and fluorescence spectrophotometry (Figure 2E and 2F). The encapsulation efficiency was measured using the following equation, EE% = [(Cargo added - Free “unencapsulated cargo”)/Cargo added] x 100, and the measurements were performed using UV-Vis spectroscopy. The ∆T2 and ∆T1 MR data were collected to confirm for effective encapsulation of GT inside MNPs (Figure 3A-3B). Drug release experiments were done by using “dynamic dialysis method”. Drug loaded nanoparticles (2.0 mL, [Fe] = 2.5 x 10-3 mol) were packed in a dialysis bag (MWCO 6-8 KDa) and suspended in PBS solutions (1X) of two different pH of 7.2 and 6.0 at 37 oC. The aliquot sampled from outer reservoir at regular intervals of time and replaced with same amount of fresh PBS. The absorbance of sample was recorded at 785 nm for Pt-drug release. The percentage cumulative release was calculated by the following formula. Similarly, MNPs aliquots were collected directly from inside the dialysis bag and both T1 and T2 MR were collected at different time points. (Figure 3C-3E). The K-RAS mutant lung carcinoma cells (A549) and Chinese Hamster Ovarian cells (CHO) were obtained from ATCC, USA. Lung carcinoma cells were grown in DMEM medium and CHO cells were grown in Kaighn's modification of Ham's F12K medium. The medias were prepared by 89% media supplemented with 10% Fetal bovine serum (heat-inactivated FBS, Cellgro), 1% Pen-Strp (penicillin-streptomycin). The cells were maintained at 37 oC, 5% CO2 in a humidified incubator. For MTT assay, A549 cells and CHO cells were seeded in 96-well plates the day before the experiment, next day cells (2,500 cells/well) were incubated with the MNPs (30 µL, [Fe] = 2.5 x 10-3 mol) for different time periods at 37 oC. Thereafter, each well was washed two times with 1X PBS and added 30 µL MTT (5 mg/mL) solution to each well and incubated at 37 oC for 4-6 h. The formation of formazan crystals observed within this time limit. The resulting formazan crystals were dissolved in acidified isopropanol (10 mL isopropanol + 250 µL c.HCl) and the absorbance was recoded at 570 nm using infinite M200 PRO microplate reader (Figure 4). Olympus fluorescence microscope (IX73) was used to establish the internalization mechanism and to observe the progression of the treatment by optical imaging. A549 cell lines and CHO cell lines were grown in tissue culture dishes (10,000 cell/well) and treated as experimental and control cell lines, respectively. The day before the experiment both the cell lines were plated and after 24 h the cells were treated with different functional nanoparticles (75 µL, [Fe] = 2.5 x 10-3 mol) and incubated in a humidified incubator (37 oC and 5% CO2) for 24 h. For internalization mechanism experiments, MNPs (75 µL, [Fe] = 3.1 x 10-3 mol) were incubated at low temperature (4 oC) and in the presence of inhibitors (10 mM sodium azide and 25 mM 2-deoxyglucose). Thereafter, the cells were washed with 1X PBS for two times and fixed by treating with 4% paraformaldehyde solution for 15 minutes. Cell were then washed with 1X PBS before treating with DAPI dye (6-diamidino-2-phenylindole, 5 mg/mL) for 10 minutes to stain cell nuclei. The cell internalization pattern was captured with help of red fluorescence DiI dye and bule DAPI dye using Olympus IX73 fluorescence microscope (Figure 5 and 6). ROS experiments were performed by using Mitosox red (Mitochondrial ROS tracking dye), dihydroethidium DHE (cytosolic ROS tracking dye) and using a fluorescence microscope. First, A549 cells were plated in cell culture dishes (10,000 cell/well) and incubated with different functional MNPs encapsulating different therapeutic drugs (5b, 75 µL, [Fe] = 2.5 x 10-3 mol) for 3 h at 37 oC. Similarly, for the inhibition assay, cells were treated in parallel with corresponding functional MNPs and N-acetyl cysteine (3.0 mM, NAC, ROS scavenger) antioxidant for 3 h at 37 oC. In a separate experiment, folate-MNPs with no drug (5a, 75 µL, [Fe] = 2.5 x 10-3 mol) was incubated with A549 cells (10,000 cell/well) and used as control experiment. After 3 hours of incubation at 37 oC, the level of mitochondrial ROS and cytosolic ROS generation were assessed by incubating separately with Mitosox red dye (5 µM) and with DHE (32 µM) dye for about 20 min at room temperature. 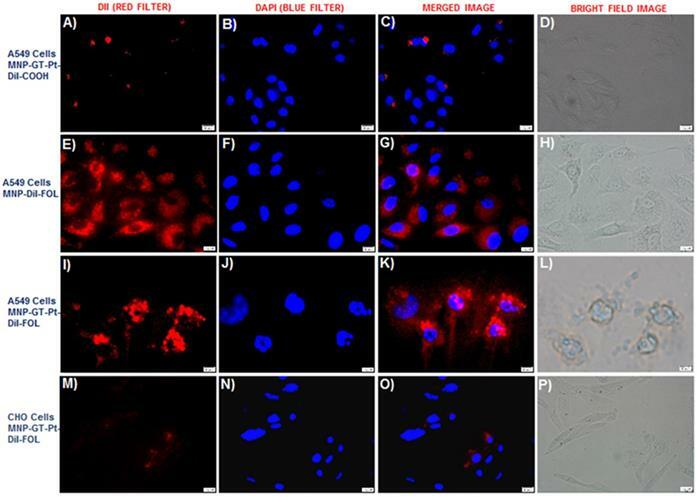 Next, cells were washed twice with 1X PBS and corresponding images for mitochondrial ROS and cytosolic ROS generation were taken by fluorescence microscope using red filter (Figure 7). Quantification of mitochondrial ROS and cytosolic ROS were performed using ImageJ software. Apoptotic and necrotic cells were quantified using fluorescence microscope (Olympus IX73) and apoptosis & necrosis cell quantification kit (purchased from Biotium). Cells were platted in tissue culture dishes (10,000 cell/well) 24 h before and treated with functional MNPs (5b, 75 µL, [Fe] = 2.5 x 10-3 mol) encapsulated with Pt drug, GT and combination of these two drugs for 12 h, washed for two times with annexin V binding buffer, and followed by addition of Annexin V-FITC (5 µL) and Ethidium homodimer III (5 µL) dyes. These dyes were incubated for 15 minutes in dark before fixing the cells using 4% paraformaldehyde solution, as described in supplier's protocol (Biotium). Finally, washed the cells with annexin V binding buffer for two times. Images were taken using FITC (green) and CY3 (red) filters of (Olympus) fluorescence microscope. 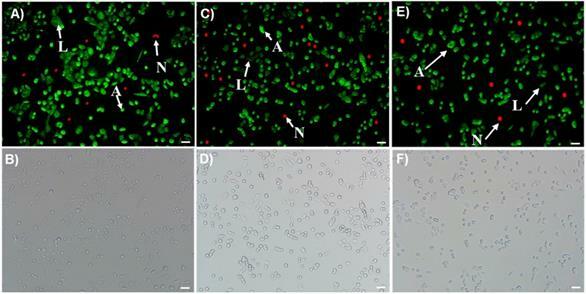 Green images indicate apoptotic cells and red images indicate necrotic cells (Figure 8). Migration or invasion capability of A549 cells were quantified using migration assay kit from Millipore and using a plate reader. First, A549 cells were starved for 18-24 h in serum free media. Next day, cells were seeded (100 µL aliquot) along with functional MNPs (20 µL, [Fe] = 2.5 x 10-3 mol) with and without the drug combinations into the invasion chamber containing collagen layer and placed on the feeder tray containing serum containing media (150 µL). The total setup was placed in an incubator at 37 oC for 24 h to allow the A549 cells to invade collagen layer. Next day, migrated cells were detached from collagen layer by placing invasion chamber on feeder tray containing cell detachment buffer (100 µL) and incubate it for 2-3 h. Next, the detached cells were stained using CyQUANT cell lysis buffer and fluorescence emission signals were recorded using infinite M200 PRO microplate reader at λem = 560 nm (Figure 9). For conducting comet assay, A549 cells were harvested on a 12-well plate (8,000 cells/well). Next, cells were treated with functional MNPs with and without (control) drugs (5, 60 µL, [Fe] = 2.5 x 10-3 mol) and incubated for 24 h. Then, cells were trypsinized and centrifuged at 1,000 rpm for 6 min. Cell pellet was resuspended in 1X PBS (pH 7.2) and mixed with pre-heated low-melt agarose at 1:10 ratio. This agarose mix (100 μL) was applied on to the comet slide. The slide was then initially kept in dark at 4ºC for 1 h, and subsequently immersed overnight in lysis solution. Alkaline electrophoresis (Trevigen) was conducted on next day following manufacturer's recommended protocol. Briefly, slides were kept in alkaline unwinding solution (pH>13) and electrophoresis was carried out for 30 min at 21 V. The slides were then rinsed twice with DI H2O and 70% ethanol, respectively. Next, slides were stained with SYBR Gold for 15 min in dark and then dried at 37 ºC for 15 minutes. Finally, images were captured using FITC filter on Olympus IX73 fluorescence microscope (Figure 10). In summary, a novel dual-drug carrying nanotherapeutics is developed for the treatment of K-RAS driven NSCLC, which is highly metastatic and mostly unresponsive to conventional treatments. We have introduced a new platinum-based antineoplastic therapeutic agent, Pt(MCO)2, to synergize the therapeutic efficacy of Hsp90 inhibitor, ganetespib, for the effective combination therapy of NSCLC. 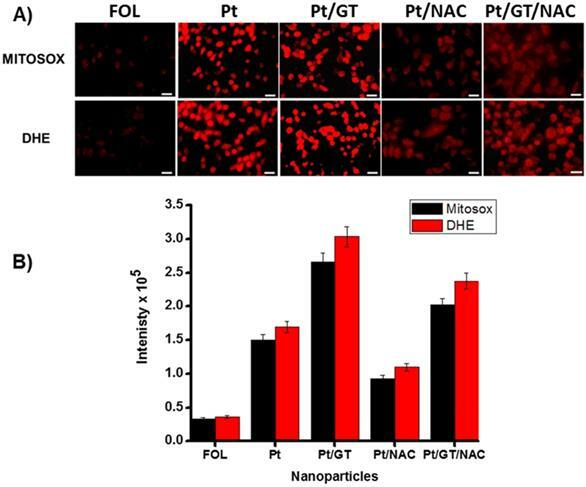 In this study, polyacrylic acid (PAA)-coated magnetic (iron oxide, Fe3O4) nanoparticles (MNPs) were synthesized and used as drug delivery system. These MNPs were decorated with folate receptor-targeting ligand, folic acid, for the targeted delivery of combination drugs to NSCLC. The receptor-mediated internalizations were confirmed by conducting experiments in the presence of various inhibitors and energy factors. We have co-encapsulated dual drugs and an optical dye within the polymer-coating of MNPs using solvent diffusion method. Result from cell viability assay showed minimal toxicity (less than 5% cell death) for functional MNPs with no therapeutic drug. This result indicated that our formulated functional MNPs are biocompatible. However, folate-decorated MNPs were able to target NSCLC and showed more than 65% and 90% cell death within 48 h of treatment, when carrying single drug and combination of drugs, respectively. These findings indicated that new Pt-drug successfully synergizes the therapeutic efficacy of ganetespib. In addition, the presence of MR imaging modality would be an additional advantage of using magnetic drug delivery system. Furthermore, experiments suggested that the new dual-drug nanomedicine induces apoptosis in NSCLC by generating ROS stress inside the cancerous cells. Results from invasion assay showed that our novel nanotheranostics effectively inhibits the metastatic nature of NSCLC and the comet assay further confirmed the mechanism of action of the dual-drug combination nanomedicine. 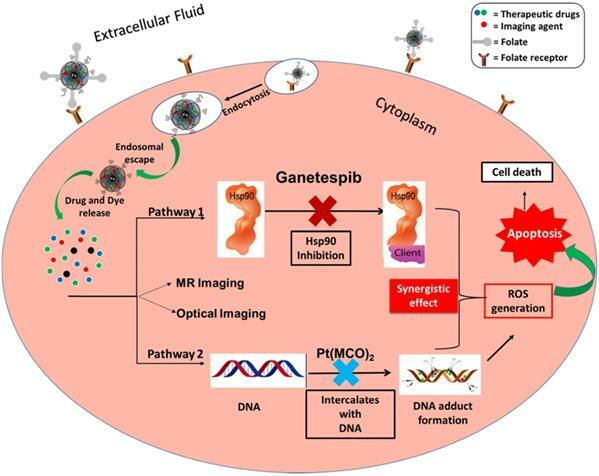 Taken together, the developed nanotheranostics enhances the therapeutic efficacy of Hsp90 inhibitor drug, ganetespib, by using a novel platinum-based Pt(MCO)2 drug in a combination approach for the effective treatment of NSCLC. This project was supported by the National Institute of Health (NIH: 1 R03 AI132832-01) to SS and TB, Kansas INBRE bridging grant (K-INBRE P20 GM103418) and ACS PRF (56629-UNI7) to SS. We thank Prof. Virginia Rider, Department of Biology, PSU, for providing tissue culture facilities.